ezDictation is an enterprise-wide digital dictation system with a voice file player that integrates hand-in-glove with E-Transcriptor. 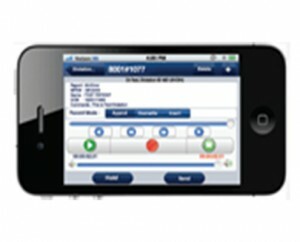 It allows physicians to dictate using any phone, PDA, iPhone, hand-held microphone, or PC web recorder. It uses open technology hardware, pedals, etc., to lower the cost of ownership. At The Shams Group (TSG), we keep up with the latest technology, providing our clients with cutting edge solutions for their healthcare needs. As the iPhone is currently one of the most widely used smartphone devices, we have developed an iPhone dictation application that integrates with the ETranscriptor dictation software. ezDictate is an easy-to-use dictation application, offered free of charge to all healthcare provider clients of TSG and its partner TeletrakMT Transcription Services (TMT). You can use this application as an alternative to landline dictation, as the functions are very similar. ezDictate also possesses certain new features in addition to those found in ezDictation. Dictations automatically go into ‘pause mode’ when you answer a call, resuming again once the call is complete. The “Hold” feature in ezDictate allows you to record a dictation in parts and edit it before finally sending it for transcription. This allows you to record part of a dictation and save the dictation for later editing. The dictation will be saved to your device, so you can edit or add to it anytime. When the dictation is finally ready to be transcribed, you can send it for transcription. Recorded dictations can be sent for transcription through Wi-Fi or cellular data. This eliminates the possibility of encountering a busy server when conducting landline dictation. Even if your iPhone is not connected to the internet, the application still allows you to record and edit dictations. If you attempt to submit a dictation without an internet connection, your dictation will simply be saved for later submission. The ezDictate app is designed with all of the features your physicians need in a easy-to-use interface that improves turnaround on transcription by getting dictations to your typist faster.